Government facility managers can significantly reduce lighting expenses through flexible, scalable retrofits with a payback time frame of a few years. Choose from retrofit/renovation strategies that are simple to complex. Editor’s note: This is the second of a two-part series on ways to cut lighting expenses in facilities. Part 1 of this series covers ways to cut lighting expenses in facilities. Each lighting control strategy can be built upon a previously installed strategy, allowing the total lighting control system to suit any space and budget. The following strategies are examples of ways to retrofit lighting control solutions one room at a time. A stand-alone soution is the simplest and most cost-effective way to retrofit for energy savings. A facility manager simply replaces the switches with dimmers. Using the dimmers for tuning and high-end trim will typically reduce electricity use by 20 percent in every space. The stand-alone solution for fluorescent lights is to replace switches with dimmers and replace switching ballasts with dimming ballasts. Fluorescent dimming ballasts are generally more efficient and cost-effective than switching ballasts. The typical payback period is less than three years. The addition of occupancy/vacancy sensors can save another 15 percent in a stand-alone system. Sensors turn off lights completely when a room is unoccupied. Wireless occupancy/vacancy sensors are ideal for retrofit applications because they require no re-wiring. Installation is easy, by attaching the sensor on the ceiling and replacing the on/off switch with a matching dimmer. With dimmers and occupancy/vacancy sensors, stand-alone systems can cut electricity costs by 35 percent in each retrofitted space. Stand-alone system retrofits yield electricity savings for individual rooms, but multiple rooms containing the controls cannot be tied together and operated as a single system. To retrofit a fluorescent lighting system that requires more complex energy-saving strategies, start with a digital dimming ballast. Digital dimming ballasts provide a flexible, scalable foundation for lighting control systems that can deliver electricity savings of more than 50 percent. Using digitally addressable ballasts allows light fixtures to be directly networked with time clocks, occupancy/vacancy sensors, daylight sensors, wall controls, handheld remote lighting controls and window shades to create a total light management system. Digital dimming ballasts can be reconfigured as spaces change. Lights can be regrouped into different zones or networked with different sensors without rewiring. Digital ballasts can accommodate any combination of sensors and controls, depending on the specific requirements of any room or building. A daylight sensor can be directly connected to a single digital ballast for daylight harvesting. Because the ballast is networked to all other ballasts, all the daylight sensors in that zone will react appropriately. Digital ballasts are the primary building blocks of a scalable lighting control system that fits a small stand-alone space, multiple rooms or areas, an entire floor, a whole building, and even an entire building complex. A combination of dimming ballasts, daylight sensors and automated window treatments can maintain the optimum light level for each space in a facility, and effectively use the available ambient light to save energy and improve occupant comfort. Electrical lights automatically dim when enough daylight is available. Harvesting daylight with dimming ballasts, daylight sensors and automated window treatments maintains overall light levels and maximizes the use of free sunlight. In addition, sheer window shades automatically close to reduce glare and solar heat gain while maintaining the view. An energy-saving retrofit can save 35 percent of electricity costs immediately after installation. By employing a scalable lighting control solution to buildings, government facility managers can get better control of their lighting costs and help reduce the government’s overall energy use. 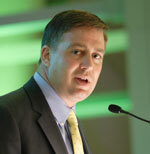 Andy Wakefield is Government Business Development Director, Lutron Electronics, Coopersburg, Pa.